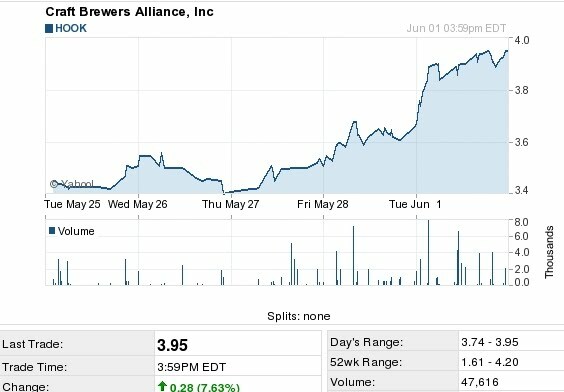 As a proud holder of HOOK (Craft Brewers Alliance) shares, my 'fortune' has risen from $262 to $395 in 3 weeks...woo hoo! I even attended the CBA Annual Meeting last week - Kurt Widmer moderates - and the parting gift was a mixed 4-pack of Kona, Redhook and Widmer beers + a Redhook DIPA bomber...nice 'dividends'! It's funny, the posts that organically get the most pageviews are reviews of individual beers. Yet that's the kind of post I feel most conflicted about. So, when did you buy your 100 shares? That beer dividend sounds pretty good. 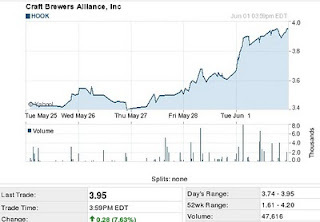 I had some extra $ when 4-5 years ago in an IRA and decided to put some into HOOK (at the time it was just Redhook; since the '08 merger into CBA Widmer is now included). Also bought some shares of SAM (Boston Beer Co). This year was my first time going to the shareholders meeting, and I'll have to say it was fun to see what goes on at one of those (a mix of dry business stuff, a marketing re-cap/preview, a Q&A session...and not just the take-homes, but 3 tap handles and food pairings...). The meeting is held at the end of May every year; and it's open to anyone, I think (even if you DON'T have shares)...see you there next year?